Check out some new class offerings. Supply lists can be found at the front desk of The Broadway Gallery. Students should wear clothes they don’t mind getting paint on. Students who miss a class can contact the instructor for make-up lessons. Potential students who would like to apply for a scholarship to attend classes at the Broadway Gallery can use this application form. Bring in or mail in this form and our scholarship chair will respond as quickly as possible. local schools. Some of our artists have been with us since we opened in 1982. Some are nationally recognized, many have won awards at juried shows, some have written and/or illustrated books. All work passionately to express their artistic visions. All feel that it is very important to have an artistic presence in the community and so choose to support this view by showing and working at the Broadway Gallery. We sincerely appreciate the support the community has given the gallery over the years. 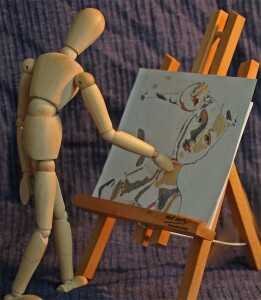 The students will experiment with 4 different mediums- watercolor or crayon, acrylic paints, charcoal and oil pastels. The students will have fun creating with these various mediums and can be inspired by spring time themes such as painting rabbits, birds, flowers, and other subjects that students would like to paint. This is a fun and enjoyable experience! The student will base their colors on the color wheel which they will make the first day. Please wear clothes you don’t mind getting paint on. provide a make up lesson. We will be learning to use watercolor to create paintings with different subjects: animals and nature including flowers. No experience necessary. Come and enjoy learning this medium using different techniques to add texture, smoothness, and layering. All supplies provided including watercolor paper and watercolors. You may want to bring your own brushes or paints to see the difference. Aprons available as needed but you may bring your own. You may want to bring your brushes or paints to see the difference. Aprons provided but you may bring your own. Sometimes using one medium is just not enough when making a painting. A painting may need further definition of values or colors. Mediums that will be used in this class for enhancing the painting may be pastel, oil pastels, acrylic paints, and charcoals. By using the various mediums, the painting can be taken to a whole other level of beauty. Color theory will also be taught in this class based on the color wheel. Make your own original outdoor pond from stoneware clay. The first class will be forming rolled slabs and decorating with texture. If you would like, bring 2-3 items to press their images into the clay. Between sessions, the ponds will be thoroughly dried and bisque fired. The second class will be glazing the ponds. They will be fired soon after the second class, and will be available for pick-up at the gallery after June 18. Experience the freedom of brush strokes that create images such as bamboo, branches, Cherry blossoms, and more. Chinese brush painting involves special bamboo brushes, ink stone, colored ink and rice paper. All these tools and supplies will be available for your use during the class. You will learn the basic holds of the brush, preparation of the ink, application techniques and composition of a typical Chinese painting. Supplies, aprons and gloves will be provided as needed by the instructor. portable. It’s an affordable medium that can be fun and unique. You learn to see through different eyes using drawing exercises that will amaze you. This class will give you the confidence to draw. We may work a little outside – weather permitting. Drawing tools included but you will need to purchase a 9×12 Strathmore drawing pad for practicing and working on some final drawings. First Thursdays on April 4, May 2, and June 7. New art, free music and snacks. Meet with friends in this special atmosphere from 5:30 – 7:30 pm. Check out what other things are happening at the Broadway Gallery on our Events or Community pages.